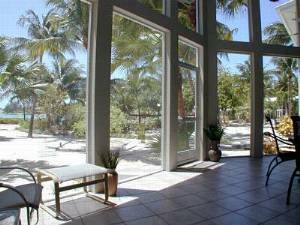 Our Cayman Islands Island House is designed for life in the Tropics where "Inside and Outside become One". Newly renovated and re-furnished, from the time you move in to the minute you depart, you'll have your own private home with all of its comforts and extra amenities listed below at your disposal. 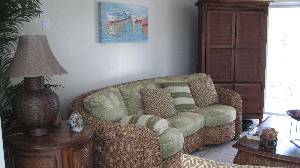 Located in a protected cove on the Caribbean Sea in the heart of Cayman Kai/Rum Point on the north shore of Grand Cayman, this Island House is ideal for a family or two couples. The Island House features a living room, dining room, music/office room with NEW high speed internet, fully equipped kitchen, laundry room, two story screened lanai, two bedrooms (one king size bed and the other has two double beds) with their own private baths, TV's and balcony's over looking the pool and a lagoon with dock and beach area with your own kayak to enjoy. Set in landscaped gardens with white sand on the quiet waters of the lagoon within 150 feet of your back door the Island House is fully equipped with every comfort for an outstanding vacation in a contemporary tropical house. Enter "Barefoot Lagoon" through a pleasant foyer and then sitting in the living room you look out through a 10 feet sliding glass door onto your lanai, backyard with a view of the pool and lagoon or the office/music room look through a 2-story wall of glass windows you will see the famous "Rum Point Beach" within a 150 feet from your front door. Turn around, see the 2 story screened-in-lanai, back yard, pool and the lagoon in the distance (about 50 feet from the back door) through 20 feet of sliding glass doors that fold away into the wall. Adjacent to the living room is the dining room and kitchen, complete with coffee maker, microwave, blender and all the necessary cooking tools. Off to the side is a closet with games and storage space, 1/2 bath, laundry room with washer and dryer, ironing board, laundry supplies. The 2 story screened in lanai contains an informal dining area (with barbeque gas grill) directly off the kitchen that provides an unobstructed view of your hand raked sandy back yard with tropical tress and shrubs leading to the pool (within 50 feet), boat dock and shoreline of the lagoon where you can launch your own one or two users kayak. 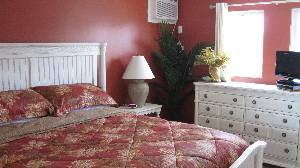 The Island House has two bedrooms suites located upstairs. Each bedroom has a full private bathroom with shower and bath, and sliding glass doors opening on to a private screened-in-balcony (both rooms have a lagoon and pool view), walk-in-closets, ceiling fans, TV's, clock radio and individual air conditioning . One bedroom is equipped with a king size bed and dresser, the other has two double beds and dresser. that come across from Rum Point Beach, through the glass windows in the front of the Island House, through the downstairs and out through the two 10 foot glass doors that slide away to open the first floor living room, dining room and kitchen to a two story lanai overlooking the lagoon and pool. Usually no air-conditioning is required. 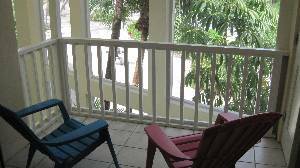 However, our Island House has full air conditioning in the first floor area and individual air conditioners in each bedroom. Its location in a protected lagoon which exits into the Caribbean Sea, lends to the beauty and charm of Barefoot Lagoon. You will enjoy kayaking in the lagoon and Caribbean sea, drifting for hours searching the ocean floor, for fish, turtles and coral or discover star fish, tropical fish and other marine life. It is not uncommon to see green sea turtles swimming around in the cove. "We offer special amenities that other rental properties don't." If water sports are what you crave for, Red Sail Sports provides everything for you just about 150 feet from your front door at the Famous Rum Point Beach. Any water adventures or equipment you might desire. Red Sail Sports has opened an impressive new Water Sports Center at Rum Point, with plenty of exciting beach toys for the young at heart along with a full diving and snorkeling trips to world famous Stingray City and the North wall. They also feature diving and snorkeling lessons and jet ski, sunfish, paddleboat, dive and snorkel gear rentals. Choose from wind surfers, sailboats, wave runners and water-skiing. To add to all this waters sports excitement is a glass bottom boat, which takes passengers and sorcerers to the famous Stingray City/Sandbar and nearby coral reefs. Changing rooms, showers and lockers add to the new conveniences. Our Island House is designed for life in the Tropics where "Inside and Outside become One". Thank you! Fabulous location ... just the right size for our family of four. We're so happy we stayed at Barefoot Lagoon and Rum Point and not in Georgetown or along the 7 mile beach. Loved the snorkeling ... saw 23 types of fish and a few stingrays along the small coral reef on the right of the pier ... not more than 100 yards from the beach ... no special tours needed! We had such a great time relaxing at the beach we did little else besides one kayak trip in the lagoon ... never got to try the bikes! Eating on the screen lanai was also a treat and we ate all our meals there. And great recommendation to have McCurley's pick us up at the airport, provide the rental car at the house and take us back to the airport. Made learning to drive on the left so much easier (and safer for all). Sunshine and great beds ... a perfect combination. We all slept so well!!! Everyone at work said I looked so relaxed -- and they were right. Thanks for the lifetime memories. Thank you for an absolutely fabulous week in the Grand Cayman. 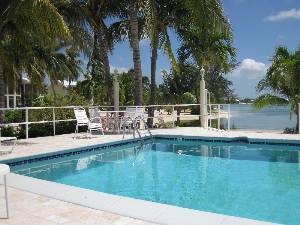 Barefoot Island Lagoon House is perfectly located and we enjoyed the pool, the lagoon, and especially Rum Point Beach. We rented a car from McCurleys, which I highly recommend, and did travel around the entire island. We decided that Rum Point is the perfect location! We enjoyed snorkeling and kayaking and especially loved seeing the sting rays swimming in the water at Rum Point. An extra special thank you for the delicious dinner at the Kaibo - a real treat! We have rented several houses through VRBO and this is one of our favorites. Mike went above and beyond to answer all of our questions and it was a vacation that the Baker Family will long treasure. Thank you and can't wait to return! vacation at your beautiful island home. Our vacation this past April was excellent and too short by far. 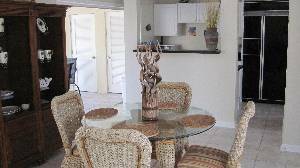 It was my parents' first trip to Grand Cayman, and they have done nothing but rave about how clean and relaxing Barefoot Lagoon Island House was. They loved walking to Rum Point everyday for lunch, to relax, to look through their small shop, and to book a Stingray City tour. enjoyed the kayak and collecting shells near the lagoon. I can't tell you how much it means to me to have been able to share such a wonsderful place with them. They work so hard for everything they have. It was just great to see the stress melt away and the smiles on their faces. Oh yeah, my husband and I had smiles on our faces too! 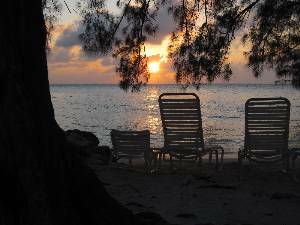 Everyone has already decided that we want to stay at your lovely home again the next time we are blessed with a trip to Grand Cayman. Barefoot lagoon was the most enjoyable vacation spot my family has ever chosen. We rented the house for a week and wish it had been two. My children loved having their own room, and the rest of the house was extremely comfortable. The kitchen was completely stocked including recipes from previous guests. We spent every morning out on the Lani and then headed to Rum Point for the rest of the day. After spending the day on the beach the kids did like the option of a pool to play in at the end of the day , the pool was just a short walk out the door and the house provided floats for use. We are already planning out return trip for this year and plan on staying 10 days. This the the iedal location for Families to stay, away from crowded seven mile beach but still reachable by car in about 20 minutes. 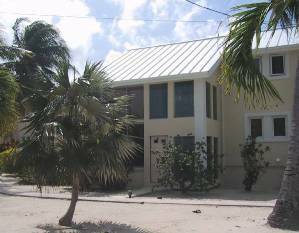 We could have easily turned two weeks into four weeks here at your lovely Island House at Cayman Kai. Everything was so lovely and comfortable. Tony and Linda D'Oranzio, Chalfont, PA.
Hi Bob, We had the "MOST" relaxing vacation we have ever had! Since we've been to 7-mile before, and have seen most of the island, we felt compelled to lay on the beach, try ALL of the tropical drinks the Wreck Bar offered, go sailing, some diving, and some eating out, and a little shopping. The house was great and we were very happy we chose yours (we had looked at another home in the area that "claimed" to be within walking distance to the beach, but in reality was not- we drove around and found it!). Our youngest used the kayak a couple of times (and we were sure to secure everything when we left), but mostly we loved the porch in the morning having coffee and enjoying the outstanding view! Thanks again- we Really all needed a break!! Dawn, Andy, Adam, Grant, and Ross Johnson, Fort Worth, TX. Deposit: SUMMER/WINTER RESERVATIONS: An initial 50% transferable, but non-refundable deposit is required to book a reservation, with the remaining balance payable no later than one month before arrival -- Deposit may be made in the form of Check, Money Order, or Wire Transfer in US dollars. HOLIDAY RESERVATIONS: An initial 50% transferable, but non-refundable deposit is required to book a reservation during the Holiday period (arrival or departure between December 17th and January 7th, inclusively), with the remaining balance payable no later than two months before arrival. Deposit may be made in the form of Check, Money Order, or Wire Transfer in US dollars. •In order to allow you to secure airline reservations and avoid disappointment, we can put a 48-hour hold on accommodations, without any deposit.